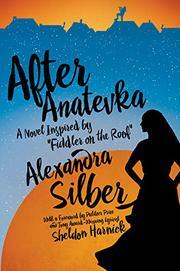 The iconic characters from Fiddler on the Roof are brought back to life in a new novel that continues their story. It’s tempting to imagine the lives of our favorite fictional characters extending beyond the margins of their stories. Just see Pride and Prejudice and Zombies for proof. In her first novel, Silber, a singer and actress who has performed many times in Fiddler on the Roof, continues the stories of two of the characters from that iconic musical: Hodel, Tevye’s second-oldest daughter, and the radical socialist Perchik, who tutored Tevye’s younger children. At the end of the musical, Perchik has been exiled to Siberia, and Hodel is leaving home to join him there. Silber picks up the narrative at this point. In her telling, Hodel is picked up and imprisoned on her way to Perchik. She’s held for a year or more in a dingy, solitary cell, where she is starved and raped. Eventually she reaches Siberia, marries Perchik, and they begin to build a life together. Unfortunately, Silber relates all this in rather florid prose, turning the humorous musical into an overheated, humorless romance. The gentle mockery with which Perchik is treated onstage is entirely absent here. He has become a serious, even tragic figure. He’s not entirely convincing, either, despite (or perhaps because of) the back story Silber has given him. Worse, Silber works in flashbacks, so while we do see Hodel and Perchik in their new present, we also have to revisit terrain already traveled by the musical. Much as we might have liked to, we don’t get to see what’s become of the rest of Hodel’s family. Lacking the humor of the original musical, Silber’s adaptation is disappointing.